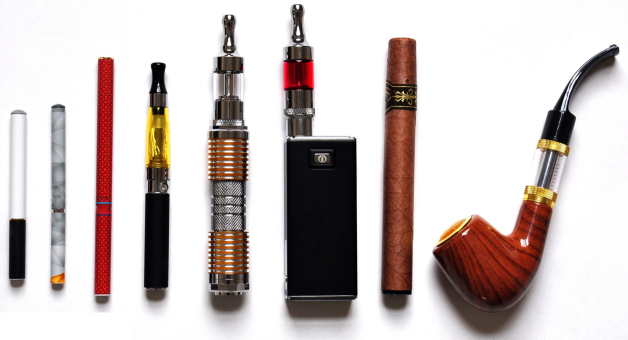 Main > Blog > Rising E-Cigarette Trend in Toronto, a Safer Alternative? Walking down the streets of Toronto you may be noticing an increasing trend that has been sweeping the globe, men and women puffing away at small handled electronic devices exhaling plumes of what looks like smoke. You may be thinking, “oh great a new way to smoke cigarettes”, but you’d be mistaken, as it isn’t smoke that they are exhaling, its water vapor. Pocket sized battery operated devices that can be discreetly held in the hand heat up nicotine or non-nicotine liquid to be inhaled giving the same appearance as lighting up a traditional combustible cigarette. Is this just another way to pollute our lungs? Or is it actual healthier alternative to smoking? As we all know, the world today is trying to steer individuals to a more health conscious lifestyle, and there is nothing more detrimental to your health then smoking cigarettes. It wreaks havoc on our lungs, causing disease and cancer long term, and is even considered hazardous to others around smokers in the form of second hand smoke. 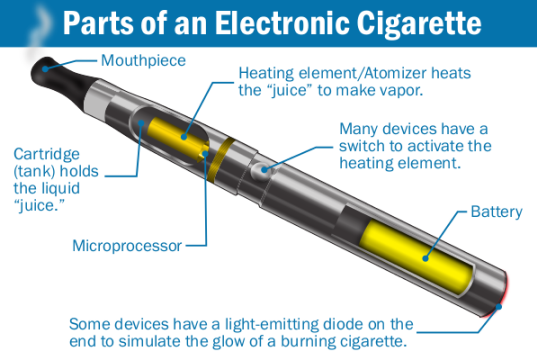 Enter electronic cigarettes, the latest in smokeless nicotine delivery technology. While delivering nicotine in alternative methods is nothing new, as seen in the form of gum or patches, those methods promote smoking cessation, while E-cigarettes are advertised as a smoking alternative, toted a least harmful method of getting your daily fix of nicotine. Everyone will tell you that smoking is bad for your health, even the smokers themselves would admit they would quit if they weren’t already addicted to them. Rightfully so as a single cigarettes contains over 4000 different chemicals, 43 of which are known cancer causing compounds . Each year more than 230,000 deaths are attributed to smoking in Canada, making it responsible for more deaths then obesity, physical inactivity or high blood pressure . So knowing this why would anyone continue this vile habit? The root of the addiction stems from a chemical called nicotine, while in itself not a carcinogenic substance like the other additives in tobacco cigarettes, it is however highly addictive as any frequent user who suddenly stops experiences withdrawal symptoms from cravings, anxiety and irritably just to name a few; the American Heart Association has even stated that smoking tobacco is one of the hardest substances to quit – at least as hard as heroin . Becoming first popularized in China in 2004, the modern e-cigarette was developed by a Chinese pharmacist and inventor, Hon Lik; he was driven to quit smoking as his father, a heavy smoker died of lung cancer . 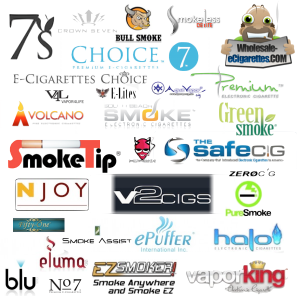 Today the industry of electronic cigarettes has boomed to over 6 billion dollars , and isn’t seeing signs of slowing down anytime soon. The point of scrutiny is the nicotine liquid itself, and its questionable effects on our lungs as one inhales. Termed “E-Liquid”, it generally consists of Propylene glycol, glycerin, water, nicotine, and flavourings , but ingredients may vary by manufacturer. The base of the E-Liquid giving it the viscosity needed to be turned into vapor is Propylene glycol or sometimes Vegetable glycerin, both considered non-toxic and safe to ingest and are in fact used as ingredients for food coloring and additives in various medicines and cosmetics , but while being safe to consume, inhaling these additives can be a different story. Reports of lung and eye irritation from vaping has been a common issue, but deeper health concerns have been proposed, as heating up these chemical concoctions can possibly expose you to Formaldehyde, Acetaldehyde, and Acrolein; all probable carcinogens. For smokers not yet ready to kick the habit altogether, switching to this form of nicotine intake may be a better alternative. On the surface one can at least surmise that e-cigarettes expose you to a fraction of the chemicals compared to traditional cigarettes, cutting down the theoretical risk of potential cancers. But it has also been documented that individuals who made the switch saw improvements in overall lung function and pulmonary health , with no serious adverse effects found in reported trails , and the evidence suggests they produce less harmful effects then tobacco overall . The electronics cigarette industry is still in its infancy and they are many things remaining to be uncovered. What are the long term health effects? Only time will tell as data is sparse (8). When first introduced, tobacco cigarettes were advertised as a healthy, even promoted by doctors in the 1930s, well before we knew they could kill; the same mistake will not be made twice as the world will keep electronic cigarettes under a fine microscope for years to come. Alcohol vs Marijuana: Which is More Dangerous ?